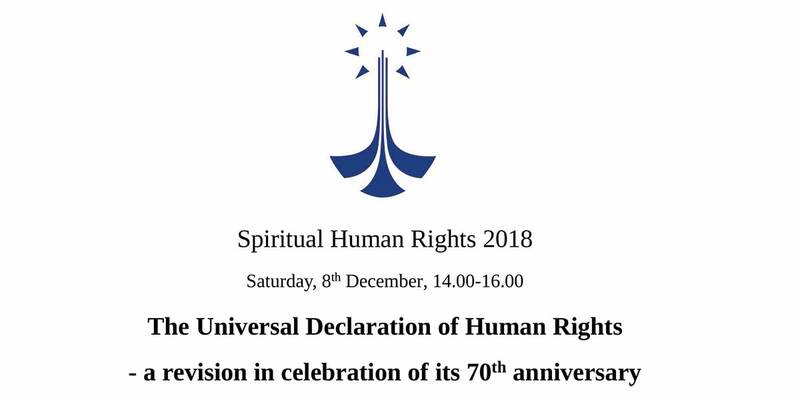 On 8th December 2018 the conference "Spiritual Human Rights 2018" organised and hosted by Soteria International, associate member of FOB, was held to celebrate the 70th anniversary of the Universal Declaration of Human Rights. Alessandro Amicarelli, FOB's chairman of the board of directors, delivered the following presentation "70 years of the Universal Declaration, we don't give up". 70 years ago the Universal Declaration of Human Rights was adopted and proclaimed by the General Assembly of the United Nations on the 10th of December 1948. It was the acknowledgement that all individuals have a series of "natural rights" pertaining to them as human beings, regardless of their origin and background or any other difference whatsoever. Ever since there have been long philosophical and legal discussions about the nature of the Declaration, whether it was really universal, whether it was binding or not and it was even "accused" of being too comprehensive and not easy to adapt to every culture and environment. It is a fact however that the Universal Declaration has enormously influenced and shaped the laws of several countries, and international organisations have adopted international human rights instruments based on the content of the Universal Declaration too. It takes time for changes to happen, but eventually change does happen. In fact if it is true that it took some 18 years and hard work for the content of the Universal Declaration to be transposed into the United Nations International Covenants of 1966, it is also true that only two years after the Declaration was proclaimed, the Council of Europe on the 4th of November 1950, adopted the European Convention on Human Rights, whose content is abundantly and mostly taken from, and not only inspired by, the Universal Declaration itself. 70 years of progresses and positive changes, and many challenges too, indeed. Challenges still persist and all human rights groups need to be vigilant and keep their and our attention on the threats to human rights in the territories where they and we operate. With the European Federation for Freedom of Belief (FOB), and the several other associates we work with, and Soteria International is a long-term friend, we mainly operate to guarantee the freedom of thought, conscience, religion and belief; without forgetting though that all human rights are integrated and interconnected and one cannot ignore the other. As a human rights organisation we keep focussing on the respect of freedom of religion and belief of and for all individuals and groups at all levels. We keep monitoring the states activities in this regard and lobby the people of good will in the institutions that are more keen to help spreading policies of humanity and justice and peace, carrying out activities that foster the right to freedom of religion and belief and prevent persecution and actually stop persecution against individuals and groups disliked by some state representatives and departments too. I don't want to give a list of problems today, there are many. I want to look at the positive side of things. But indeed there are still many issues to be addressed. I will briefly report about a case in Italy. Twenty years ago in 1998, 16 children were removed from their families that were being accused of the hateful and horrible crime of pedophilia, within the frame of "Satanic" masses with orgiastic rituals involving minors. These children were assessed by psychologists and social workers instructed by the state, namely by the judges. These children were eventually removed and the families were destroyed as a result. There were no evidence of the allegations, no proofs of any sort, as the accusations were based only on the assumed findings of psychologists and social workers, those were the evidence used in court. Few days ago, after 20 years, some of those children, that are now adults, have been able to reunite and see again their parents, if still alive. The whole case was a gross mistake, there was no substantial evidence, but for the sake of the public's satisfaction, the scapegoats were found. As usual when some media want to attract the attention of the public they just need to use some trigger words like "cult", "Satanic", "guru" and indeed "orgies", as the sexual element is always a very interesting one, and the dish is ready, regardless of the effects that such sensationalised piece of fake news may have on the lives of people invloved, it doesn't really matter. What does matter is that very piece of news, evidenced or not, and to have some helpful anti-cult association giving a hand to help spreading the story within their circles with some conferences and presentations; someone will also write a new book on the "cult" or on the "guru" and the next 10 or 20 years of soemone will be destroyed for the sake of the career of someone else. There are still groups making pressure so that "brainwashing" and "mind manipulation" legislation are passed to make it easier to fight against "cult leaders" and "cults" as such, as they repeat at meetings and conferences, as they did also few days ago; they say they need these instruments to make it sure that these "criminals" are prosecuted effectively, regardless of the facts that most of the times these "criminals" are not criminals at all, and as in the mentioned case after 20 years you can see the real side of the story and the many mistakes made by the state. Can we imagine what would have happened if such a mind manipulation legislation had existed at that time? Psychologists and social worker would have evidenced that the mind manipulation had occurred, anti-cult associations would have provided evidence of the Satanic element in the assumed rituals, and the story would have been even tougher as the only evidence in the hands of the judges would have been "that proof", whether genuine or fabricated, doesn't really matter. European countries would be just like those countries that make lists of unauthorised groups, like the xie jiao (meaning heterodox teachings) in China for instance, that are made illegal and persecuted. If you're on the list, it is assumed that you manipulate the people and consequently you have to be persecuted and the job is much easier. Fortunately, attempts of this kind in Europe, have been stopped by either the intervention of the national or the European institutions, but we must keep being vigilant as every time there is a new attempt to establish dubious institutions and pass dangerous legislation that would prevent the freedoms of people. I like to recall that the European Federation for Freedom of Belief, along with Soteria International, the CESNUR and several other organisations, have been working together to address the problem of religious persecution in different countries and in China over the last years. We have been reporting about many issues and only now after long debates and hard work also the official media have started reporting about the persecution of members of The Church of Almighty God (CAG) and the Muslim Uyghurs detained in re-education camps. The Church of Almighty God (CAG) and the Muslim Uyghurs are considered and treated like criminals and terrorists in China where a legislation against these groups exists; the same would happen if the legislation against cults was passed in the European countries. As positive developments, it needs to be recalled that the Italian authorities have started accepting the applications for refugees status coming from the members of The Church of Almighty God (CAG), even though mostly after appeals filed in Court against the refusals, and that the British government has officially shown support to the complaints I personally filed at the United Nations on behalf of members of that relgious minority in China. Let me conclude by saying that while we want Europe to be a safe place where criminals are prosecuted and abuses are stopped and prevented – and in this regard we are happy to say there are many judges and state officials that do their work professionally and even under pressure in many cases; likewise we want Europe to be a place of freedom and liberty, where everybody is free to practise their religion or spirituality or belief or non-belief in the way they like, with respect and respecting others, without pressures from the states, without undue constraints and limitations, and indeed without threats coming from groups that would like to stop their activities through the introduction of laws that are normally used by dictators to stop their opponents. For a detailed analysis of the legal instruments available in this field and to see how FORB, freedom of religion and belief, can actually be implemented, see the Call of the EUROPEAN FEDERATION FOR FREEDOM OF BELIEF (FOB) to the European Nations to Promote and Implement the Right to Freedom of Belief, Thought, Conscience and Religion in Europe. Let's keep working together for the good and for the liberties and freedoms of the people.